This plot shows the ratio for iron (top) and lead (bottom) for neutrino deep inelastic scattering cross sections versus the fractional momentum of the struck quarks (Bjorken-x) for MINERvA data (black points) and the prediction (red line). Para una versión en español, haga clic aquí. Para a versão em português, clique aqui. Pour une version en français, cliquez ici. Physics is a holistic science in which we consider not only the individual parts but also how these parts combine into groups. Nucleons, or protons and neutrons, combine in groups to form atomic nuclei. The differences between how free nucleons behave and how nucleons inside a nucleus (bound nucleons) behave are called nuclear effects. In the past, scientists have measured nuclear effects using beams of high-energy electrons. These high-energy beams allow electrons to interact with the quarks contained inside nucleons and nuclei, an interaction called deep inelastic scattering, or DIS. Scientists can now also bombard nuclei with neutrinos, which can also induce deep inelastic scattering. 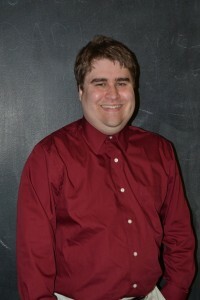 Studying these interactions can help us understand the behavior of quarks. Using a beam of neutrinos, MINERvA has performed the first neutrino DIS analysis in the energy range of 5 to 50 GeV. Neutrinos and electrons interact with quarks within the nucleus differently; we do not expect nuclear effects in neutrino DIS will be the same as electron DIS. MINERvA observes DIS interactions by measuring the cross section, or probability, of a neutrino interacting with quarks inside bound nucleons as a function of a property called Bjorken-x. Bjorken-x is proportional to the momentum of the quark that was stuck inside the nucleon. MINERvA took data on neutrino interactions with carbon, iron and lead nuclei. We compared these data to a theoretical model that assumes the nuclear effects for both neutrino and electron interactions are the same. 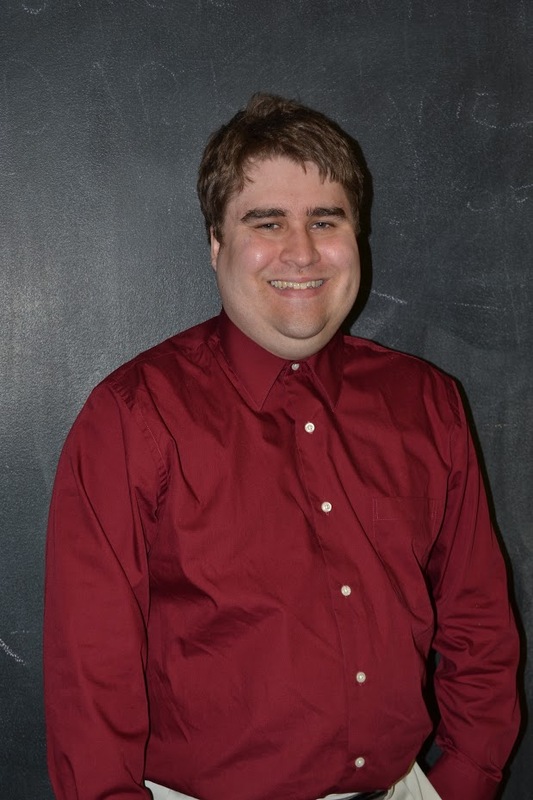 Joel Mousseau of the University of Florida presented this result at a recent Joint Experimental-Theoretical Physics Seminar. 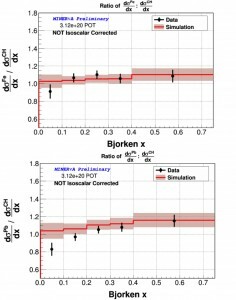 We found that the data did not agree with the assumption in the lowest Bjorken-x values (0.1 to 0.2 — see figures) for lead. Further, the cross section for lead at those values differs significantly from those for carbon or iron. We say that the nuclear effect is enhanced in that region for lead. This enhancement was seen in a previous MINERvA inclusive analysis that considered all kinds of interactions together — without singling out deep inelastic scattering. 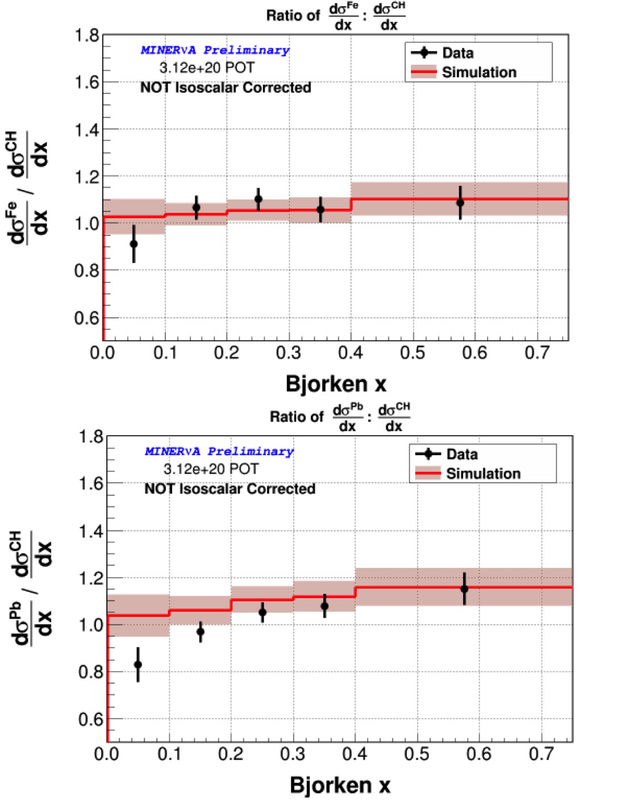 In contrast, the model in the largest Bjorken-x range (0.4 to 0.75) agrees very well with data. This is intriguing, since the cause of nuclear effects in this region is not well understood. Whatever underlying physics governs behavior in this region, it appears to be the same for neutrinos and electrons. This information is very valuable in building new models of this mysterious effect. Understanding these effects are a priority for MINERvA and will be studied more extensively using data we are currently collecting, taken at higher energies and higher statistics. This data will be invaluable in resolving the theoretical puzzles at large and small Bjorken-x.